Rest, Recovery and Rehab is the Key to Sport Performance. Home » Rest, Recovery and Rehab is the Key to Sport Performance. Managers, coaches and athletes are under serious pressure to perform at their best and must be prepared to allow time for rest, recovery and rehab as part of their training. We have three basic types of tension; muscular, emotional and mental in the body, which are responsible for all the tension of modern life. Through the systematic practice of Yoga Nidra, rest, recovery and rehab can be achieved faster. I am revealing a whole new theory of improving your performance by just “being” and not “doing”. Letting go cannot be forced or planned but can become a lifestyle. What you are looking for is a state of awareness where tension is released from the body on a physical level and your mind completely switches off. Rest is something we do naturally, and we don’t need any special training or techniques. However, profound rest is something very different. Rest, recovery and rehab techniques are crucial components of any training program. High performance athletes feel the need to train for longer, harder and stronger to hold the competitive edge in their sport. Competitive athletes can also have a fear of losing and may lack true faith in their own abilities. Short-term or active recovery usually takes place directly after training or a match. This is usually a short session of low -intensity stretches to ease out muscle tension. The physical aspect of SportsYoga is an excellent form of cross-training and can be implemented as the cooling down session after games. 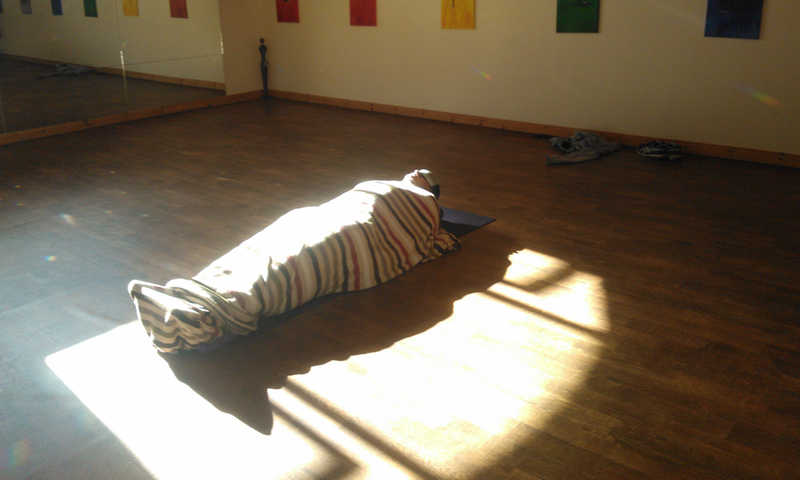 The practice of yoga nidra can be implemented into long-term recovery. The majority of people relate ‘rest’ with activities like listening to music or walking in nature, or simply having a quiet time. Relaxation is something we do naturally, and we don’t need any special training or techniques. However, profound rest is something very different. It quietens your mind and releases physical tension in your body. In a state of deep relaxation, your heart beat and breathing slow down, and your body and mind become deeply calm. I train elite athletes in The University of Limerick to gain that extra 1% through rest and visualisation. Yoga nidra is an efficient method of inducing complete physical, mental and emotional relaxation while maintaining awareness. Sometimes after intense physical activity, you will experience pain in the body because of the muscle stretch. According to an article in The New York Times, whenever the body undergoes heavy physical activity, calcium ions leak into the muscle cells, causing the muscles to contract and feel tired. Releasing lactic acid and the physical release is only one aspect of yoga nidra. The human body has the power to heal itself during yoga nidra and in the case of sport injuries; the athlete can help to speed up recovery time by simply being aware of the injury. Another important aspect of yoga nidra is the harmonising of the two hemispheres of the brain and the two aspects of nervous system – sympathetic and parasympathetic. The rotation of body awareness stimulates different parts of the brain that control each and every body nerve. When you are aware of each part of your body, you are actually massaging the corresponding part in the brain as well. You establish the connection between the body and the mind. Include yoga nidra in your training schedule and reap the benefits of optimum performance with clarity of mind and the clear mental focus of your goals. Profound relaxation technique, release of lactic acid from the muscles, switch off your mind, complete belief in your own ability, dealing with pre-match tension, techniques on dealing with distraction during matches/races, methods to increase synergy within a team, and post-match rehabilitation.